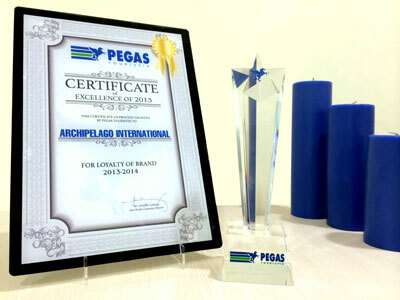 Bali, 20 May 2014 – As recognition of Archipelago International's exceptional level of service and top quality facilities, the hotel management company has been awarded the "Loyalty of Brand" Certificate of Excellence by "Pegas Touristik", one of the biggest, leading tour operators in Russia. Not only does the award reflect the exceptional experiences offered at Archipelago-managed hotels, it also provides a reflection of the brands' leadership in boosting Russian influx to Indonesia and beyond. Archipelago International is one of Indonesia’s leading hotel operators with an underlying portfolio of more than 80 hotels and 12,000 rooms. Operating under the hotel brands Grand Aston, Aston, Aston City, Alana, Harper, Quest, favehotels, NEO and Kamuela, ranging from ultra-luxurious private pool villas to serviced apartments and select service economy class hotels, Archipelago International offers Indonesia’s vastest and most comprehensive hotel network. The certificate was awarded to Archipelago International in Bali on Thursday 15th May 2014. It was received by Lestari Holmes, Archipelago International’s National Director of Sales for Australia and Europe. “We are delighted to receive this award from Pegas Touristik. It proves that our valued guests are pleased with what we are doing here at Archipelago International, whilst at the same time, it is an incredible boost for our team to continue to provide the best services for all.” Says Norbert Vas, Vice President Sales & Marketing Archipelago International. 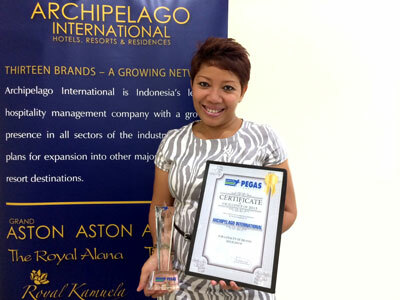 Picture of Ms. Lestari Holmes, Archipelago International’s National Director of Sales – Australia/Europe, holding the award. Archipelago International is one of Indonesia’s leading hotel operators with an underlying portfolio of more than 80 hotels and 12.000 rooms and a development pipeline exceeding 90 properties in Indonesia, the Philippines and Malaysia.